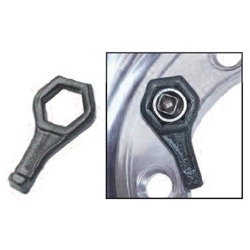 Cap Nut Wrench SAE 1-1/2" Ken Tool TX9 / BOWES KT TX9. Wrenches hold outer cap nut on dual wheels while the inner nut is turned. Lip fits in hole to secure wrench in place. Sizes offered fit standard and metric cap nuts.